You are here: Home / Win a FREE website! 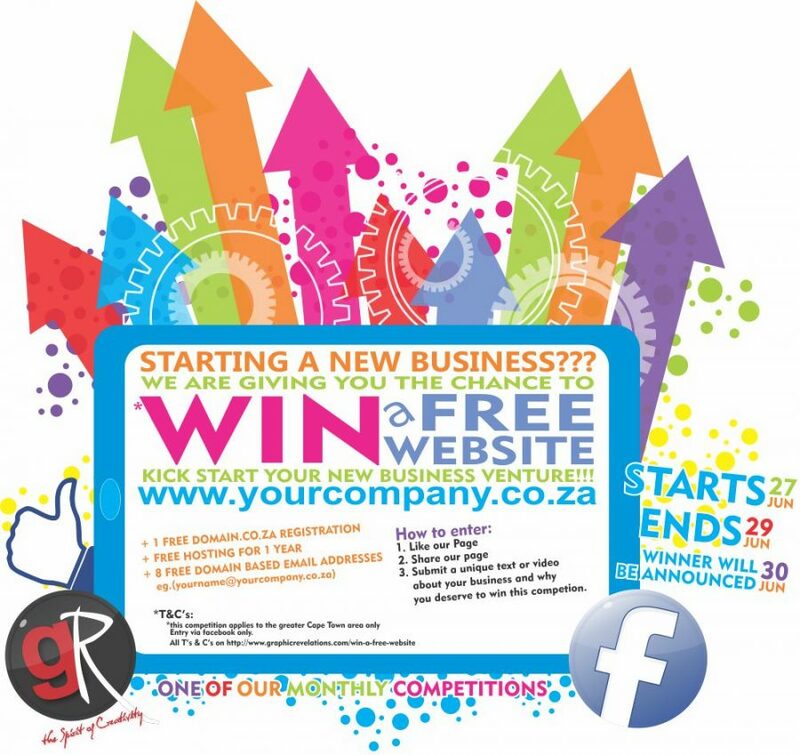 Enter our WIN A FREE WEBSITE competition. All you need to do LIKE OUR PAGE, SHARE OUR PAGE and submit a short written motivation or motivational video on our facebook page. Tell us why YOU should win. Are you starting a new business or have you recently started a new business? Does your business operate in the greater Cape Town area? Do you want to grow your business by having an online presence? Only Facebook entries will be accepted. Only written and video entries will be accepted. This competition applies to businesses operating in the greater Cape Town area only. Only ONE available .co.za domain will be registered. Registration is valid for one year only and the winner may choose to renew or terminate the domain after the period expires. A free 500mb shared hosting package valued at R779 is valid for one year only. Thereafter the winner may choose to renew or terminate the hosting package. Monthly and annual hosting options are available. The winner undertakes to supply written content and images for the website. Graphic Revelations take no responsibility for copyright on content and images supplied by the winner. Winners will be announced on our facebook page on afternoon of 30 June 2016. The winner will also be contacted via phone or email. By entering the competition you give consent to receive our newsletter and information on new competitions and promotions. You may choose to opt out on receipt of your first newsletter. By entering you give consent to Graphic Revelations publishing and using your photo, new website and company info on our Facebook page and website for marketing and advertising purposes.